Pain d’Epice reminds me of Rosemary Manell who was my neighbor in Belvedere, California where I grew up. Rosemary was my culinary mentor. She had been the camera ready gal for Julia Child. Whenever you saw those wonderful dishes coming out of the oven, they were prepared by Rosemary. When Julia sat down at the end of the show to dig into the luscious offerings on the table, those offerings were made by Rosemary. We enjoyed Rosemary very much and she collaborated with us on various toppings for Boboli in the pre-Boboli days. 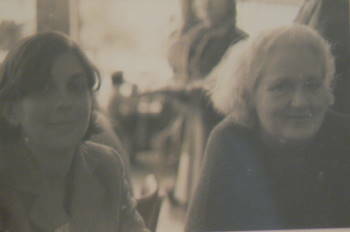 Rosemary and me at Ratto’s in Oakland, California in 1979. 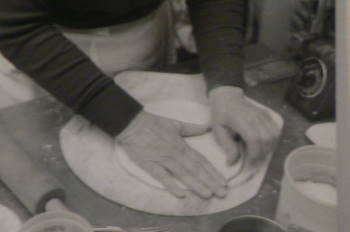 Rosemary loved making pizza and she loved making pasta. She was an excellent cook in her own right. Most of all, Rosemary was a generous culinarian who shared her knowledge with others and loved doing so. When I began making Pain d’Epice, Rosemary told me that in France, Pain d’Epice was sold in tins and the older the Pain d’Epice the higher the price because this “quick” bread improves with age. It is very important not to over mix the Pain d’Epice batter because honey works on rye if over beaten by toughening it. Preheat the oven to 400 degree and prepare two small loaf pans that would measure 7 1/2″ by 3 1/2 ” by using plenty of pan release. 1/4 cup good quality rum, 1 1/2 teaspoons ground anise seeds, 1 teaspoon ground cinnamon, 3/4 teaspoon ground ginger and 1/4 teaspoon ground cloves. 1 cup rye flour, 1 cup of white flour and stir until just combined. Add one more cup of rye flour and a half of a cup of white flour and stir until just combined. 1 teaspoon grated orange rind, 2/3 cup chopped almonds and 1/2 cup chopped raisins or currants. Stir until all in combined but do not overbeat. Pour into prepared loaf pans and bake at 400 degrees F for 10 minutes. Reduce the heat to 350 degrees F and bake another 50 minutes. Test with at toothpick to make sure the loaves are baked through. Cool and wrap in foil or a plastic bag and store for a few days before cutting into the loaves and serving.